For this month’s “A lovely year of finishes” I am targeting to finish one of 3 quilt tops. 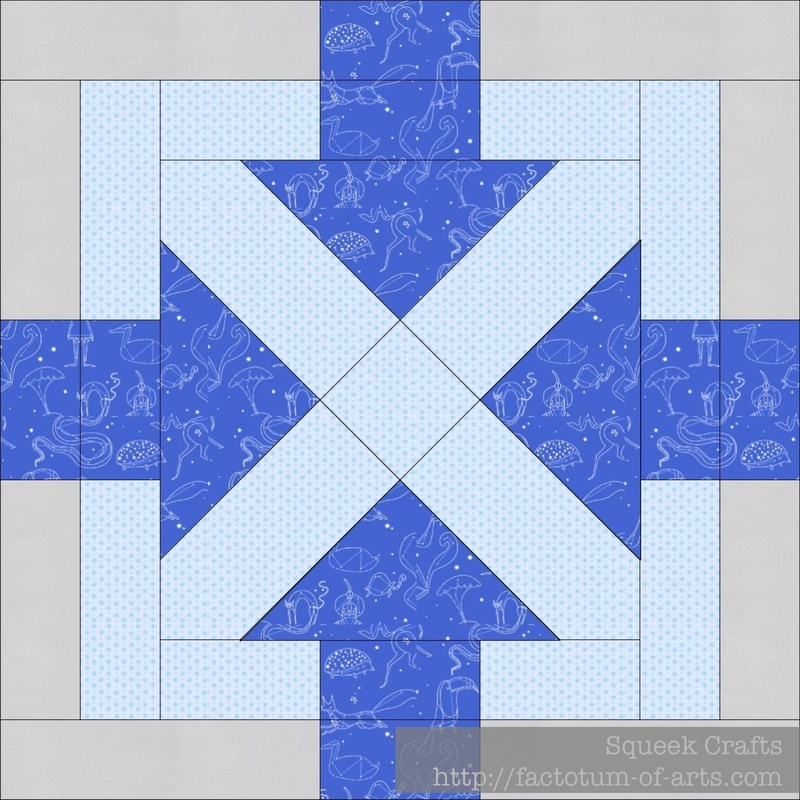 I do not think I will get that quilt top finish, but the good news is I finished my first quilt design for the first quilt. 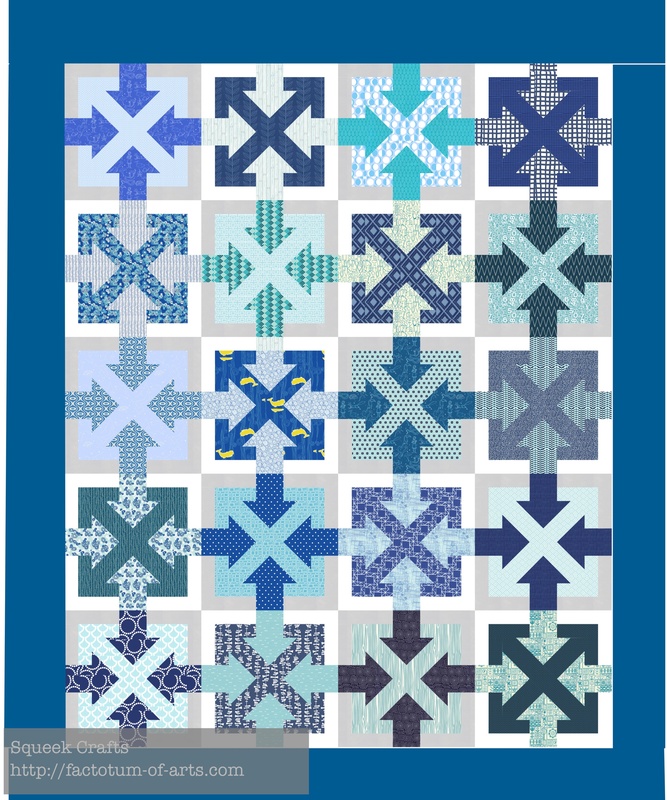 The quilt is for a boy who loves blue, so playing with blues and this design here is what I think the final quilt will look like. What do you think? 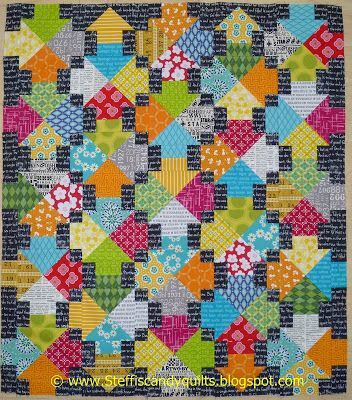 This entry was posted in Uncategorized and tagged a lovely year of finishes, arrows, Block design, blue fabrics, patchwork, quilt design, quilting, that way, this way, threadbias.com on September 22, 2013 by mlwilkie. Very nice! This is already looking great. It’s going to be exciting seeing it transferred to fabric. Love it! What a great design you have come up with! Can’t wait to follow your progress! Oh wow. I love both! Great job! Love your design – go for it! Thank you – I didn’t know until you mentioned it 🙂 Congrats to you as well. This is going to look incredible! What did you think of the Threadbias tool – is it pretty intuitive? It is not too bad, there are a couple of things I would change. The thing I like the most is you can cancel at any time and just use it for the month you have paid for. This looks really great! The back and forth with dark and light fabrics is great. I like that it’s all made of arrows (in the centres, obviously) but that depending how you look at it, sometimes it’ll just look like a generic background and then other times your eye will make it pop up and look like an arrow – like an optical illusion. I will do my best. I will dig some patterns out and make sure I know how to write one up. What a fun design! I love how the darkness of the fabric appears to make the arrows change direction. This looks great, Michelle! I’m excited to see what you pulled from your (*amazing*) stash!